Video: We Get Around Founder, CEO and Chief Photographer Dan Smigrod presenting the company's Matterport 3D Showcase WalkAround tour solution to 600+ at Atlanta Tech Village Monday, 29 September 2014. Video: Forum Founder Dan Smigrod interviewed by Barrie Fisher at IVRPA 2016 in Quebec City. I continue to be the biggest fan of Matterport. I remember my first scan – literally the first rotation of the Camera. At that moment, I knew that Matterport was magical. No longer would I need to stitch images together to create 360º spherical images AND I could leverage 20+ years of marketing experience working with major cable television channels and entertainment brands to grow the Community – We Get Around Forum (formerly known as the Matterport User Group Forum) and the We Get Around Referral Network of Matterport Pro 3D Camera Photographers and Real Estate Agents. We Get Around is on track. So, what about Matterport? Looking back 10 years from now, the most important dates in the history of Matterport will be the days that Matterport makes its 3D and VR and Related APIs and SDKs public. ✓ WP3D Models Zip It! Tool – an easy, fast and free way to download Matterport SnapShots in a Zip! Today (3 November 2016), we only see the tip of the iceberg of what’s possible: either by Matterport or Third-Party Developers such as WP3D Models Developer @rpetersn and MatterApps Developer @Metroplex360. The easiest way to imagine why the public availability of the Matterport APIs/SDKs ‘matters’ is to think about the apps that you use today that you could not live without – all possible because of millions of apps created for iOS and Android. Now imagine that possibility for Matterport. While I could imagine that releasing APIs/SDKs are a “top priority” … I could also imagine that the Matterport tech team is spread super-thin by SO many different initiatives that Matterport is tackling simultaneously: all requiring features to be added-excluded-added-excluded in the public APIs/SDKs. Once these essential tools are public, we will begin seeing amazing possibilities become reality in ways that we have imagined and can not even imagine – all because of the data that the Matterport Camera captures. That data is (truly) the MAGIC of Matterport. Matterport knows that it is not in the Camera business. They are in the recurring revenue business of 3D processing, 3D hosting, VR conversions, .OBJ files (I imagine Matterport charging for data in various formats), 2D floor plans and likely many more recurring revenue streams and ancillary revenue opportunities. I could imagine multiple cameras tied to the Matterport platform. Think of inventing electricity and the lightbulb simultaneous. Matterport had to invest a Camera, an App for running the Camera, a way to process the images, a way to host the images and a way to distribute the images. Now add VR, a consumer solution and the Matterport tech team is taking steps forward as quick as they can. Today, if Matterport takes 30 steps forward working on the Camera, App, processing, hosting, distributing - and all its other initiatives, I think of that as a linear progression: 1, 2, 3, 4, 5, 6 etc. When the APIs/SDKs become public, those same 30 steps forward become an exponential progression: 1 / 2 / 4 / 16 / 256 / 65,536, etc. Nearly all of us jumped on Matterport because of the 3D magic. Many Matterport Service Provider business names include 3D or Showcase. Now, we’re starting to see Matterport Service Provider names that include VR in recognition of the power of Virtual Reality. VR is the next big platform. Whether it happens next years or five years from now, I want to be early: not late. And while real estate agents are likely not the best prospects for talking about a platform that has a couple of percentage points on VR Headset penetration, there are plenty of business-to-business opportunities for all of us, including salespeople bringing the location with them. Just this week (1 November 2016), Google launched Tango AR Smartphone system with the first device, Lenovo’s $499 Phab2 Pro. TechCrunch reported that Matterport Scenes is one of about 25 apps available at launch. While the knee-jerk reaction of many of us might be that’s competition for the $10,000 in camera, camera gear and accessories that we have invested in Matterport, that’s like comparing a DSLR camera to a smartphone. I view Matterport Scenes app as Google Cardboard is to Gear VR. Rather than pirate our Matterport Service Provider business, I see Matterport Scenes as helping grow demand for scans done by professionals with professional tools. Matterport Scenes will amplify the message for what’s possible with depth data. Some of us can remember black-and-white-analog-transistor-TVs and “mobile” phones quaintly called bag phones because they came in a big and very heavy bag. “The ENIAC [computer] … occupied about 1,800 square feet and used about 18,000 vacuum tubes, weighing almost 50 tons,” according to the Smithsonian. In today’s dollars, it likely cost $50+ million. Today, that computer is within 3 feet of us 24/7. We call it a smartphone and it is likely thousands of times even more powerful than that 1940s computer. As exciting as everything we have seen from Matterport, we still may be in the ENIAC days of 3D-VR-360 and related tech known and unknown on planets known and yet to be discovered. For all of us, the future - the future of Matterport and everything in this eco-system – can not happen soon enough. Why are you excited about the future of Matterport and our Matterport Service Provider businesses? Wishing you exponential growth and for the future to arrive sooner (than later). Well said Dan, you've done an exceptional job of putting into words what in a nutshell is Matterport now as well as where MP must and I repeat must position itself in the future. We have all joined this very exciting ride and have taken the bumps along the way as we learn to navigate the world of VT and VR. But like any emerging tech things can change very fast and MP must change with then and allow other to development solutions which complement their technology. If not then they may eventually parish. I say this as the new Realsense camera that's in the Lanovo phone is the future and can preform beyond what the first generation cameras that are in all of our cameras. It just a matter of time before a competitive solution is introduced to the market place that may even offer an open API. Once that happens then MP will have to play catch up and as we all know they may never recover as those of us who are serious in continuing our business will sell our outdated cameras which will flood the market and sales for MP will dry up. I think that this post should be made sticky. We love our Matterport Cameras. We love the Showcase platform. We all celebrated when CoreVR launched just a few weeks ago. We are passionate about our Matterport Cameras and are all very invested in this platform. We are so passionate and in love with our cameras that we are extremely vocal in our opinions and I think it's very important that we all remember how very special the technology we have is. Good info and exponential goals. I wager that many people in that WalkAround tour were wowed if they got to test VR headsets. I'm still amazed at home many people have never experienced a basic VR adventure. Imagine how the business might take off if lots of people knew what it was like to tour a real environment in VR. From the goals list, it looks like the developers are busy. But, I still look forward to the day when we can manipulate a dollhouse while wearing a VR headset. Daydream has it's new controller, Oculus is working on a hand controller and Unity just announced the upcoming ability to develop VR environments while you're IN a VR environment. With so much going on maybe Matterport might alter it's name a bit in the future the way Dominoes did. Dominoes no longer sells just pizza and Matterport isn't just a VR camera that builds VR models for realtors. I've been checking daily for a new non-Pixel phone to come out that works with DayDream. I want to play with the controller. The Axon 7 claimed to have Daydream support but now they can't guarantee it. Today, the Huawei Mate 9 launched today with Daydream support but it may cost more than the Pixel XL. Microsoft will give us more details about their VR headset in December and who knows what else is goin on in the VR world. When Matterport makes the SDK public, perhaps 3rd party developers can help port Matterport experiences to a variety of competing VR platforms. It's good to see that Street View's back in the picture. That's still one of my favorite experiences. If nobody's tried the Gear VR Viso Places Street View app, I urge people to check it out. It's infinitely better than the regular Google Cardboard Street View app. I haven't been able to find any existing Google Business Tour homes within Viso Places. That's probably because you have to type a desired location or speak it. But if you could tour Matterport Street View homes in a real Street View app, you'd probably have a lot of folks eager to look into creating and using Matterport / Street View tours. I think you're right about Matterport's MAGIC being the data. The magic of Google is also probably it's data. WIndows is nothing but data bits but it made Microsoft a fortune. Keep the updates coming. 2017 should be the year of VR/AR where nobody wants to live in the real world anymore. I have been watching matterport since you bought in 2 years ago Dan waiting for a time when Australia was ready. I now have 2 camera's and looking enthusiastically for ways to make my mark in the matterport space. We are certainly in an amazing time of tech and I take my hat off to the guys producing 3rd party add ons as that is where the real magic will come from, I just hope Matterport realise that. Don't be afraid of competition this is how the space will grow, we invested in a camera that will be obsolete in 2-5 years so build that into your costs, and dont be afraid to reinvest as new tech comes out. I concur with @dansmigrod, I'm quite optimistic about the future of this platform. Like many of you, this relationship with MP has two facets: an emotional one, that is about the pleasure to own and appreciate the outcome of such a cool device. Then there is the business engagement, which is about making money and ROI. This forum has enabled us to nurture both aspects of this relationships and I'm hopeful that in the future, there will be more open communications with MP representatives, so we can eliminate some of the guesswork that emerged in many of our posts. I personally see Exponential Growth for this field in general but the current situation of Matterport reminds me very to the one at Soundcloud. They also got 100+ Mio. and now their short before dead cause the have missed some very essential decisions or took the wrong ones. Matterport wants to be a key partner as software hub and not just a camera vendor. In comparison what they achieved in the past 18 month it´s not really impressive. SORRY. I know people you could do this in 3 month when there´s a budget. Remember: MP has NOT yet managed a proper Facebook-Sharing or direct integration, but promoted and advertised this feature about 15 month ago. Also their UX/UI is really not that great. I believe in the technolgy, but I´m not sure if MP plays any role in this future. @mori I personally feel that MP has an immense role to play in this field. But you have to take your attention away from real estate a little to see it. Some people are already doing amazing things with MP spaces and I'm hoping they allow developers the chance to advance it. A Member of the Forum asked me to post this. You are 100% right. I look at you not only an expert – but an advocate – for Matterport Service Providers. Thank you for your excellent job. I also completely agree with your vision of MP potential. I know how hard is to get in the VR business. Many of us saw MP as a tool to get in. I know Realtors mentality. I used to think that the realtors mentality was only a local issue. It is not. For my readings of several discussions in the forum, I understand that it is a problem everywhere. Why? Simply because people don't like to change their behaviors and most of them (realtors) will change only if they must. Why change if you're comfortable? Anticipation is the key word and one day new trading, more cost-efficient, brokerage solutions will be available on the RE market. Guess you agree with me on that. MP has a wonderful product. Easy to use. Expensive but with Value. A product that allows us to dream. I run a very small startup here. I saw the potential of VR/AR technologies. When I discovered MP I "fell in love". Guess many members of MUG also fell in love. The analogy is evident: Romance. The problem is that the bride (MP) seems to have her own agenda and probably (1) not the same one that we (MSP's) have and (2) not with the same goals we would love to share with her. Can we trust this bride? Seems not, at least as we saw what she recently did. The trust we use to have on her was some how - damage. More, seems to many of us that the bride doesn't care a lot about us. Seems, at first sight, we were (are) a convenient way to achieve her goals. I see VR & AR as tools to develop new products and improve the marketing of other business. VR and AR are disruptive technologies that will (already do) allow deep changes on the way we communicate. And more is coming. 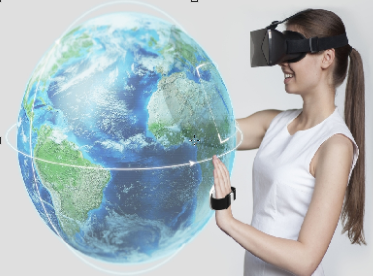 We all have heard of several usefull and valuable(new)projects using VR and AR technology targeting the "3D-RV-Space" market. Could we use MP in these projects? Yes, we could but... the problem is, as mentioned before, do you trust this beautiful bride? Will she get on track ? Don't know. Does she have the right to take different decisions? Off course she does. And let's be honest. The bride is very smart, intelligent and she did not ask us "do you want to marry me?" More, she knows very well how beautiful she is. I know that several companies are looking in. New brides. Guess there are several products under development that will be new solutions for the markets we work on, with useful services and products for us, MSP's. At the same time - and this is important to all of us - the Forum community maybe very valuable - for those new brides and we as Forum + MSP's may take advantage if we anticipate it. People who are renovation a house are happy to spend money on a scan, if it means I have to spend less hours on creating a usable CAD model, making it cheaper for them in the long run. I still see a lot of opportunities using the Matterport data as a foundation to a lot of "3rd party products". Currently there are a lot of interesting developments going on which will open up a lot of business opportunities. Virtual Reality being just one of them. I just replied to an e-mail from Matterport regarding my application for access to their new VR-SDK. I really hope to gain access to it some time soon, and see what this SDK is all about, as well as seeing what Matterport is aiming for at the moment. I didn't see much discussion about the browser-based regular Showcase. If part of the Matterport magic is in the dollhouse and VR has no dollhouse, the dollhouse magic resides in a browser-based Showcase. The more I play with the dollhouse, the more magical it seems. Maybe Matterport has plans to enhance the browser-based experience since that's where most people work and live -- in a VR-less world interacting with a mobile or PC browser. "Why Matterport instead of something else?" Nobody that I know of has Matterport's dollhouse. Other services have regular VR tours built from panos. As a user, why would I choose a Matterport Core VR experience over a competitor's "Virtual Home Tour"? When it comes to VR Showcase models, we see more benefits that separate them from competitor VR tours. Those benefits include transitions and blue circles you can use to navigate. However, some competitors without those benefits have navigation menus that headset users can use to move from room to room. I'll assume that newer Core VR and Showcase VR models will gain additional functionality. As the majority will use the regular browser version over VR versions, I completely agree on the importance of the regular version. I can see some ways to integrate a dollhouse view in to a VR application though. Imagine the doll house view floating in front of you in a 3D space when called up on. Only additional requirement is a way to interact with it. With the GearVR I can see the buttons on the side of the HMD to be used for rotation for example. Wouldn't be ideal though. An additional motion-controller (or two) could really enhance the VR experience. Maybe you can check out the Street View Gear VR app I've listed (not the one Google offers). It's UI is one of the best I've seen. Here's a screenshot I took from within Gear VR while exploring a Street View house using the Gear VR. 3) I click one of the thumbnails to transport to another location instantly. 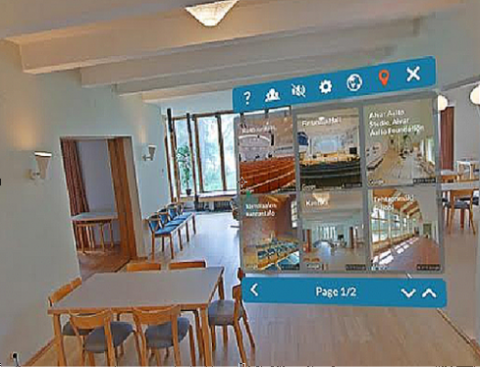 Or, since it's Street View, I can walk around the room just as I would in a Matterport model. That menu also has other buttons such as one that lets you view your favorites/bookmarks and bring up the Map to see where you are. Another way to move is to click a location on the map. Supposedly you can also share your Street View VR experience with other people around the world who are running the app the same time you are. That's a group VR tour with voice communications. I haven't tested that capability. This Street View program is nothing more than a regular Unity app that has a menu in it. You can even page through the menu. The developer also enabled Bluetooth controller options making it possible for us to bypass the Gear VR headset's controller pad entirely. Finally, you can close the menu to get it out of your way and continue exploring your environment. I'm working on a similar Unity app that has a floating menu. However, this is still one of the best ones I've seen. Imagine a giant menu appearing in your room right now. It's just that realistic in the APP because it's a virtual menu floating in your environment. The only reason I'd want a Pixel would be to explore hand controller motion. If Microsoft, HAPTO and other 3rd party companies can make that happen, VR developers may have a chore on their hands creating VR apps that work with a myriad of platforms, proprietary software and controllers. For instance, many Android Bluetooth controllers exist, but some do not work with all Gear VR apps. I am familiar with those floating menu's indeed. They look really cool in VR. Replacing this floating 2D plane on which the menu is projected, by a "dollhouse-like" model, that you can spin around and use as a "teleport portal", could potentially bring it to "the next level" in my opinion. The Hapto controller reminds me of LeapMotion, which is available right now. I imagine a lot of people getting motion sickness by moving around using their hands though. But really cool to use for interacting with menu's! Thank you for the plug @DanSmigrod! We remain wildly excited about what is (and will be) possible to accomplish with Matterport technology. Here at WP3D Models we feel so fortunate to be a part of this community and to be "at the tip of the iceberg" re: what is likely to be possible in coming months. We remain very optimistic that Matterport will open the doors (or at least unlock them) with a published SDK and open up very unique opportunities for developers to better leverage this very special technology. Thanks. More excitement. Fewer bumps. I always enjoy your insight. Please create some new discussions on topics you are thinking about. Sounds like we're all aligned on the MAGIC of the data (that we have barely even explored or imagined. Yes. It would be nice if Matterport could add some transparency: especially for the status of their APIs/SDKs. Matterport announced plans to release an API well over a year ago (and said coming soon). Perhaps if they could help us understand the delay, we'd all feel better about the Mother Ship. Yes. Matterport 3rd Party Developers have already demonstrated what they can do in days with the (unofficial) Matterport API that takes Matterport months (and years, if we include Matterport Studio). It's hard not to be impatient knowing what is possible. Your are a great example of an amazing Matterport 3rd party developer, if only Matterport gives you access to their firehose. You are other great example of a Matterport 3rd party developer that adds so much value to the Matterport eco-system. I imagine that if you actually had access to all the data and tools - without being constrained - you would add exponential value to the Matterport ecosystem. Let's hope the light turns green sooner than later. WGAN-TV Live at 5 (pm ET Today, 12 September 2017) discussion about Matterport Content Distribution (formerly known as Matterport Syndication Beta). Matterport Content Distribution is an example of leveraging the Matterport APIs/SDKs to create exponential growth for Matterport (and hopefully for Matterport Service Providers). Hopefully, Matterport to Google Street View happens sooner than later.